[Editor's Note: The following was submitted to Substance on October 7,2009, but we didn't get to post it until October 13, 2009, because of the business here and about this topic. We're sorry for the lag. George N. Schmidt, Editor, Substance]. U.S. Attorney General Eric Holder (above, at podium) spoke carefully regarding the brutal murder of Fenger High School student Derrion Albert and 'youth violence' in general during the heavily attended press conference at Chicago's City Hall on October 7, 2009. Holder was one of three individuals who spoke and answered questions from the nearly 100 reporters and camera crews from around the world that jammed into the stuffy room for the media event. The other two were U.S. Secretary of Education Arne Duncan (second from left, above) and Chicago Mayor Richard M. Daley (to the right of Holder, above). Substance caption and photo by George N. Schmidt.This morning as I write this post Attorney General Eric Holder and the Dunc are meeting with Mayor Richard Daley in Chicago to offer more money, no doubt, to put more police in and around the apartheid Renaissance schools of Chicago. No doubt Mr. Holder, reflecting the views of the President whose political sense regarding racism and privilege has displaced his moral sense regarding race and the lack of privilege, sees the death of honor student, Derrion Albert, as a tragic result of gangs out of control, thuggery on the rise, and a lack of community involvement. The political calculus, in fact, does not allow Mr. Obama or his surrogates to even discuss the systemic institutional racism and privilege that provide the ever-present grounding for any of the overt, figural actions of bigotry or prejudice that President Carter alluded to some weeks back, and that Mr. Obama denied. Barely visible to most of the press during the carefully scripted City Hall press conference on October 7, 2009, was Ron Huberman, who had been hailed until recently as a protegé of Chicago Mayor Richard M. Daley (above at podium) and the subject of fawning articles and profiles (see "Numbers Man" in Chicago magazine) in Chicago's corporate media. Huberman (far left in the above photograph) was virtually hidden behind and alongside of retired Chicago Bears star Otis Wilson (in front of the American flag, above). Otis Wilson was one of those providing the requisite 'diversity' backdrop to Daley when the TV cameras were turned on. Ironically, Otis Wilson had done much more work in education — and with young people in Chicago's South Side and southern suburbs — than Huberman. After briefly serving as a Chicago police officer, Huberman became Mayor Daley's Chief of Staff, then went on to work as President of the Chicago Transit Authority. He was appointed "Chief Executive Officer" of Chicago's public schools by Mayor Daley after President Barack Obama tapped Arne Duncan, the former Chicago schools CEO, to be U.S. Secretary of Education. Huberman's claims to know a special system called 'Data Driven Management.' Those following Chicago's schools closely noted that Huberman's data driven management crashed into Chicago reality on September 23 and September 24, 2009. On September 23, Huberman delivered a bizarre report to the Chicago Board of Education outlining a plan to reduce 'youth violence' based on a computer analysis which supposedly showed which 200 students in Chicago's public schools were most likely to be shot during the 2009 - 2010 school year. The Chicago media had hailed the program in its usual ritualistic praise for programs coming from Mayor Daley's school reform team, and the program received $60 million from Duncan's federal funds. Less than 24 hours after Huberman's report, Derrion Albert was dead. The realities of Fenger High School and Chicago's vast segregated South Side ghettos had called into question all of Huberman's pretenses at once. On the morning September 24, there was shooting at Fenger High School, but no one was hurt or killed. The shooter outside the school was quickly arrested by the huge number of police that had been deployed to Fenger since the school went out of control during the second week of school (September 14 - September 18) as a result of the school reform policy known as 'turnaround' (which had fired all but a handful of Fenger's veteran teachers the previous June, on the recommendation of Duncan, followed by Huberman). After the September 24 morning shooting and the arrest of a 15-year-old with a gun outside Fenger, school officials reportedly told the gang members at Fenger to "take it away from the school" if they wanted to fight. When school let out at 3:00 p.m. on September 24, 2009, they did, going more than a half mile northeast of the school to the corner of 111th St. and Stewart Ave. for a major gang brawl which resulted in the murder of Derrion Albert. Albert was not shot to death and reportedly was not considered a likely victim of murder under Ron Huberman's computer models. At the City Hall press conference (above), Chicago officials made sure Huberman was not introduced, although he was nearby, and no questions were referred to Huberman. Substance caption and photo by George N. Schmidt. Derrion's death is so upsetting to so many because it represents an affront to the cheap solution of racial containment and the gospel of individual initiative that we apply to the social symptoms of a problem that no billionaire philanthro-capitalist is vaguely interested in tackling. If AIG was too big to fail, poverty in America is too big to fix — at least in the view of those who want to continue to shrink democratic governance to the point that it can be dragged into the bathtub and drowned to benefit the virtues of selfishness and unrestrained capitalism. Derrion had done everything right, after all, hadn't he? He had worked hard and been nice, keeping his nose to the grindstone and was making grades that put him on the honor roll and on the path to college, it would seem. He had passed the Cosby Quiz and the Thermstrom Test of "No Excuses." He even had a family that loved and supported him.
. . . .During Albert's funeral, the Rev. Jackson focused on students rather than black-on-black violence in general, according to newspaper reports. He told funeral attendees that the National Guard escorted black students to an all-white Arkansas school in 1957 to ensure that they could walk to and from school safely. He declared that similar intervention is needed in present day Chicago. The most prominent African American civil rights leader from Chicago of the past 40 years, Rev. Jesse Jackson of Operation PUSH, was deliberately excluded from the October 7, 2009, City Hall press conference about 'youth violence.' Jackson was at City Hall and standing less than 100 feet from where Eric Holder and Arne Duncan were speaking to more than 100 reporters between 11:15 and 11:30 that morning, while the cameras rolled. As reporters (left above) were leaving the press conference a few minutes after the events shown in the previous two photographs, Rev. Jackson was talking with 9th Ward Alderman Anthony Beale (above, center). Beale is one of 50 members of the Chicago City Council — and an unknown to almost all of the reporters in the room when the cameras were on, but Beale had been invited by Mayor Daley and Daley's media handlers to stand behind the mayor, Holder, and Arne Duncan during the media event. 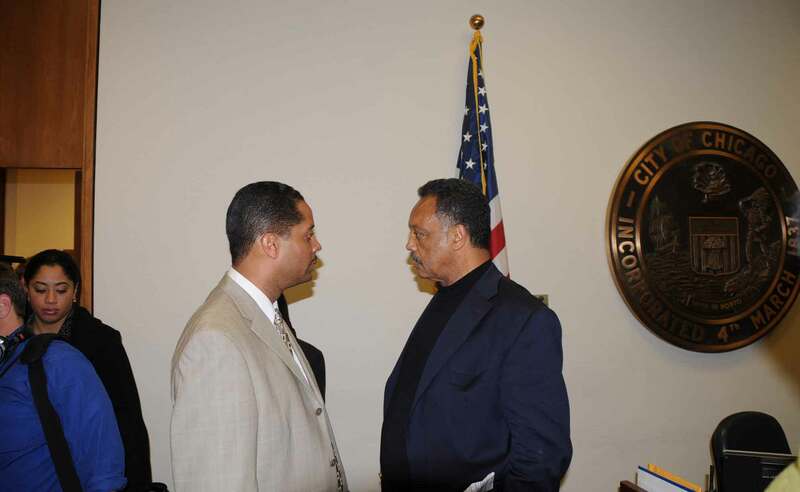 Jesse Jackson was kept outside the room by Chicago police. The exclusion of Jesse Jackson from the event was part of the carefully scripted corporate media manipulation that Chicago executed during the October 7 events. Substance photo and caption by George N. Schmidt. The irony here is that in 1957, the Little Rock Nine needed protection from violent white segregationists. Today, black youth need protection from one another. Whites historically devalued black life with race-related terror, but somewhere down the line blacks have also learned to devalue black life. Given this, I'm not sure that a stronger police presence will end the violence. What's needed is a psychological intervention of sorts. Black youth not only need to know that their lives are salvageable but that their lives and their peers' lives are worth living. In short, killing other black youth really does amount to self-destruction. The question now is how do you address the psychic wounds created by the legacy of racism and the resulting social ills that have taught blacks their lives are worthless? So then we need a psychological intervention “of sorts,” as the author suggests? Notice that this would require only to fix the insides of children's heads, rather than fixing the crumbling communities and schools and families and despair and lack of health and dental care that our system of privilege has created for those who must be denied so that others will thrive. And we have that psychological intervention on the boards ready to scale up, as evidenced by recent corporate media coverage on NBC and MSNBC for the apartheid KIPP Schools, Inc., which contain children in total compliance school sects and brainwash them through an applied program of intermittent learned helplessness and learned optimism. 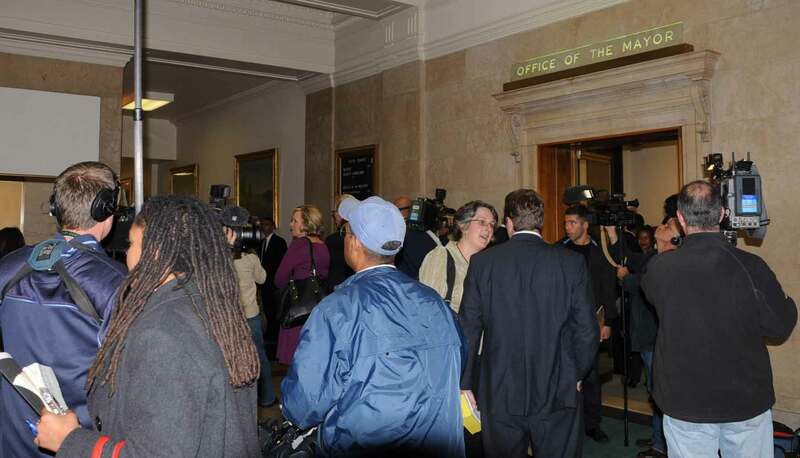 Immediately after the October 7 City Hall press conference, most of the reporters went outside the mayor's fifth floor office to try to continue asking questions of Eric Holder, Arne Duncan, and Mayor Daley. What they did not know was that the U.S. Justice Department and the U.S. Department of Education would be able to go out a back door, behind a phalanx of Chicago police who barred the media from any further questions. They then returned to their hotel suites at the Four Seasons Hotel to continue their media events with selected media personalities — such as CNN's Anderson Cooper. The CNN celebrity reporter got an exclusive interview with Arne Duncan. The interview was held — not at Fenger High School, but at the Four Seasons Hotel. By noon on October 7, it was clear that Arne Duncan would not be at Fenger High School or anywhere near it because Duncan's handlers would not be able to control questions regarding Fenger and the Derrion Albert murder. Anderson Cooper didn't ask about the distance between the Four Seasons and the segregated ghetto 20 miles to the south where Derrion Albert had been murdered two weeks earlier. Substance caption and photo by George N. Schmidt. We are going to heal those psychic wounds, alright, even if it is with a corporate charter school shortcut that, in fact, preaches there are no shortcuts. Final edited version of this article posted at www.substancenews.net October 13, 2009, 4:00 a.m. CDT. If you choose to reproduce this article in whole or in part, or any of the graphical material included with it, please give full credit to SubstanceNews as follows: Copyright © 2009 Substance, Inc., www.substancenews.net. Please provide Substance with a copy of any reproductions of this material and we will let you know our terms — or you can take out a subscription to Substance (see red button to the right) and make a donation. We are asking all of our readers to either subscribe to the print edition of Substance (a bargain at $16 per year) or make a donation. Both options are available on the right side of our Home Page. For further information, feel free to call us at our office at 773-725-7502.